DES MOINES, Iowa – Des Moines Performing Arts is pleased to present multi-platinum, Grammy Award-winning band, CHICAGO, at the Des Moines Civic Center on Tuesday, May 22, 2019 at 7:30 p.m. Single tickets will go on sale Friday, Nov. 16 at 9 a.m. and can be purchased at DMPA.org, the Civic Center Ticket Office, and by phone at 515-246-2300. 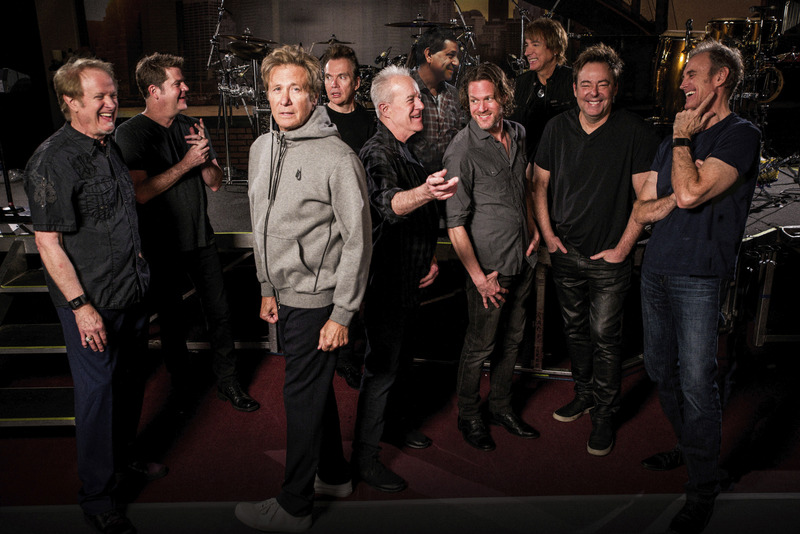 CHICAGO will perform their unforgettable collection of music and their greatest hits to include: "Make Me Smile," "Saturday In The Park," "25 Or 6 To 4," "You're The Inspiration," "Beginnings,” "Hard Habit to Break," "I'm A Man," “Does Anybody Really Know What Time It Is,” "Hard to Say I'm Sorry," "Feeling Stronger Every Day," "If You Leave Me Now," "Just You and Me," “Call On Me,” “You’re the Inspiration,” “Look Away,” “Colour My World,” “ Baby, What a Big Surprise,” “Old Days,” “If You Leave Me Now,” ”I’m A Man,” “Call on Me,” and songs from their Album released in 2014 "NOW" Chicago XXXVI! Hailed as one of the "most important bands in music since the dawn of the rock and roll era" by former President Bill Clinton, the legendary rock and roll band with a horn section, CHICAGO, is the first American rock band to chart Top 40 albums in six decades. From the signature sound of the CHICAGO horns, their iconic vocalists, and a few dozen of ever-classic songs, this band's concerts are celebrations. The band is now in their 50th consecutive year of touring without missing a single concert date! In March of 2013, Chicago's multi-platinum two-disc bestseller, “The Very Best of Chicago, Only the Beginning” charted at No. 1 on two Billboard charts: Catalog Chart and Digital Catalog Chart. In Billboard Magazine's list of Top 100 artists of all time, CHICAGO came in at No.13, the highest charting American rock band. Chicago’s first album, Chicago Transit Authority, was inducted into the Grammy Hall of Fame in 2014 and the band performed on the Grammy stage for the first time that year. Lifetime achievements include: Grammy Award, multiple American Music Awards, a star on the Hollywood Walk of Fame, a Chicago street dedicated in their honor, and keys to and proclamations from an impressive list of U.S. cities. Record sales top the $100,000,000 mark and include 21 Top 10 singles, 5 consecutive Number One albums, 11 Number One singles and 5 Gold singles. An incredible 25 of their 34 albums have been certified platinum, and the band has a total of 47 gold and platinum awards. CHICAGO have toured every year since the beginning - they’ve never missed a year. The original four band members are Robert Lamm on keyboards and vocals, Lee Loughnane on trumpet and vocals, James Pankow on trombone and Walt Parazaider on woodwinds. The band line-up also includes Wally Reyes, Jr. on drums, Keith Howland on guitar and vocals, Lou Pardini on keyboards and vocals, Ray Herrmann on sax and flute, Neil Donell on vocals, Brett Simons on bass and Ramon "Ray" Yslas on percussion. For five years, CHICAGO raised over a quarter of a million dollars to fight breast cancer for the American Cancer Society by hosting a winning bidder on stage to sing, "If You Leave Me Now" at every concert. The band is also generously supporting many other charitable causes by donating a portion of their ticket sales to organizations such as Kelly Cares, established by Notre Dame head football coach Brian Kelly and his wife Paqui, Hannah and Friends, an organization that serves children and adults with special needs, and Ara Parseghian Medical Research Foundation, which seeks a cure for a fatal children's disease, Niemann-Pick Type C.
Robert Lamm and James Pankow have become the latest inductees of the Songwriters Hall of Fame at the organizations 48th Annual Induction on June 15th in New York City. These legendary songwriters wrote mega-hits such as, “25 or 6 to 4,” “Saturday in the Park,” “Feelin’ Stronger Every Day,” “Make Me Smile,” and many others. For additional information about CHICAGO, please visit DMPA.org.